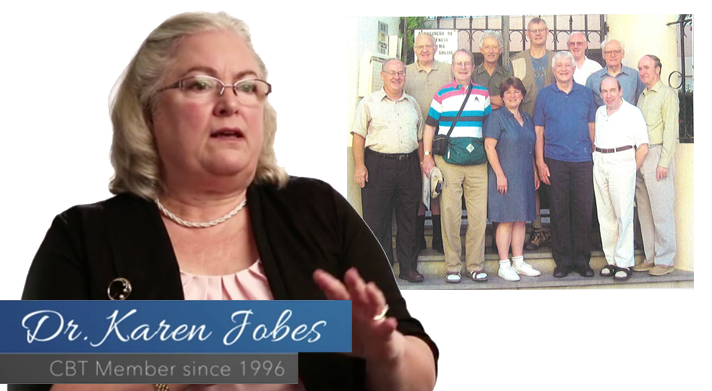 Karen Jobes joined the Committee on Bible Translation in 1996 and became the first woman in the group. When the NIV New Testament came out in 1973, Karen Jobes read through it eagerly. The NIV version of Gospel of John had come out a few years earlier and had a serious impact on her spiritual life. “It seemed so natural, and the language seemed both beautiful and contemporary at the same time,” Jobes said. She never imagined she would one day be responsible for helping to maintain this balance. Jobes pursued a career in computer science, earning a master’s degree from Rutgers University. She liked her day job, but she began to realize she enjoyed studying the Bible each week in preparation to teach Sunday school far more. After twelve years in computers, she decided to leave the tech world and enroll at Westminster Theological Seminary, eventually earning a doctorate in biblical hermeneutics. The Committee on Bible Translation, in the midst of its work on a revision to the NIV, contacted Jobes as she was finishing her dissertation. Since she had spent the past several years studying Esther, the committee asked, would she work through it and suggest any changes that may need to be made to the NIV translation? After receiving her proposals, the CBT asked Jobes to come to its next meeting to discuss them, and in 1996, it asked her to become a permanent member of the committee. She became the first woman to formally join its ranks. Since then, Jobes has continued to help the NIV maintain the balance of accuracy and literary style that made the translation so meaningful to her more than 40 years ago. “The process of Bible translation really needs a number of people to contribute to it in order to achieve accuracy, beauty, clarity and dignity,” Jobes said. “We don’t want it to be our voice. We really do want it to be accurate and clear, and that involves facing hard issues,” Jobes said. Representing the original text as faithfully and clearly as possible is worth any amount of time and effort for Jobes and all of the CBT members. The balance of faithfulness to the original text and modern English is what has made the NIV Bible accessible to millions, opening God’s Word to readers worldwide over the decades—including a young woman named Karen Jobes. “That motivates us all,” Jobes said.